Here at Octopus Group we strive to do amazing work for clients, and sometimes that means delivering big campaigns that involve Octopedes from across Creative, Brand Engagement, Strategy and Planning and Research – bringing a whole host of skills and experience together to deliver really creative and effective campaigns. 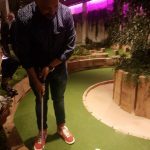 We recently undertook a huge piece of work for Vodafone’s Cloud & Hosting division, developing an exciting new brand awareness and demand generation campaign called ‘A Cloud That Can’, and bringing it to life through content, research, paid media and OOH advertising, as well as a cool internal comms programme. Since launch, the campaign has been a real success, and to celebrate the hard work of the team, they were awarded on our Superstar Awards! 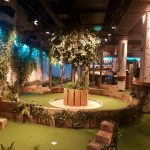 Last Thursday, saw the team head to Swingers, London’s coolest crazy golf venue, for a night of putting, holes in one, sporting banter and plenty of drinks and food! We’re a pretty competitive bunch, so it soon turned into a battle of the putts with a fiercely competitive nine-hole showdown Account director Sammy Jamieson was our overall winner, beating Luke Whitton, Billy Hamilton Stent and Dave Montrose to the top spot on the podium, and saw him topping Swingers’ overall leaderboard of best rounds of the week! 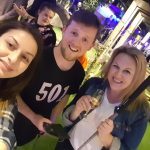 Celebrating the creative brilliance, hard work and commitment of the teams is really important to us – and when we get to marry that with a fun night out, we’re all on to a winner!